Simplistic and budget bedroom idea with most of the attention given to the stunning wallpaper on the ceiling and the walls for a suave appeal. This simple and yet easy to incorporate bedroom concept can be an ideal concept for all kinds of spaces, mainly because the attention is on the posters of the wall. The main color of the theme is a light shade of green with posters used in the ceiling and walls. 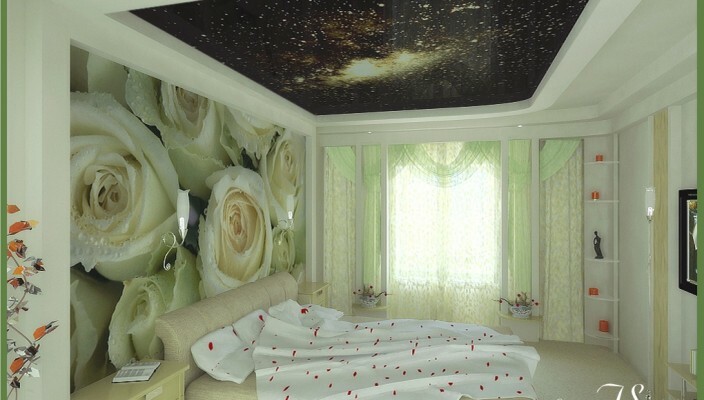 The walls feature a poster filled with roses, while the ceiling poster is all about a starry night and the large universe. The bed and the side units are in a light green shade, and the same shade has been used for the walls. Reducing the need for other essentials, this bedroom concept is easy on the pocket.